532 pages | 11 B/W Illus. 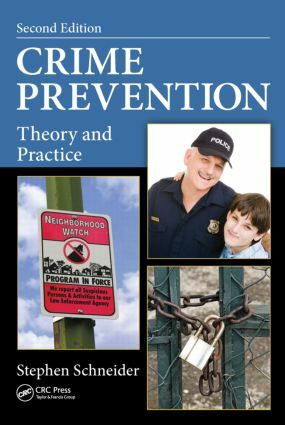 In Crime Prevention: Theory and Practice, Second Edition, Dr. Schneider has updated every chapter in this reliable text using the latest research, the most recently published articles and books, and feedback from professors and students using the first edition. Providing an introduction to dominant approaches, key concepts, theories, and research, the book supplies concrete advice on planning, implementing, and evaluating a crime prevention plan. This edition includes a new chapter applying crime prevention through social development principles to adolescents and young adults. This chapter is a recognition of the disproportionate rate of offending by adolescents and young adults as well as the distinctive risk factors faced by these groups. It also emphasizes the unique nature of applying social problem-solving solutions to adolescents and young adults who have been in formal contact with the criminal justice system. The focus is on recidivism prevention, an often-ignored, but critical aspect of crime prevention. Laying out a systematic blueprint for a successful crime prevention project, the book also updates the extant literature on crime prevention—in particular the addition of research that has been published since the first edition of this book. Updated case studies reflecting new data present real examples of crime prevention programs and organizations and illustrate the conceptual, theoretical, and empirical elements of the book. Learning objectives, discussion questions, and exercises facilitate learning and retention and a companion website provides ancillary material for students and professors. "Straightforward and easy to understand, the second edition of Stephen Schneiderâ€™s Crime Prevention: Theory and Practice delivers what its title promises. It examines various approaches to crime prevention, analyzing strengths and weaknesses, history, and progress. What separates this book from others on the topic is that case studies and academic research results illustrate theories in action and demonstrate real-life outcomes. The author chose wisely when gathering the case studies, with examples from all corners of Western civilization. As cultures continue to mingle and merge, such information will become increasingly relevant." Stephen R. Schneider, PhD, is an associate professor in the Department of Sociology and Criminology at Saint Mary’s University in Halifax, Nova Scotia, Canada. His main areas of expertise and interest include crime prevention, organized crime, and policing and law enforcement. He has worked in the field of crime prevention for more than 20 years as a scholar, researcher, community-based practitioner, consultant, and government policy analyst. Dr. Schneider has assisted numerous community groups in developing and implementing crime prevention plans. He most recently completed a report on how to prevent and control serious and chronic criminal offending by youth and young adults for the Halifax Mayor’s Roundtable on Violence.